Merrill Edge stands out for its research. Trading fees aren’t the lowest, but free trades are available to qualified investors. The Bottom Line: Merrill Edge offers robust research and low fees, but access to commission-free ETFs is limited. Integrated with Bank of America. Free trades for eligible Bank of America customers. Minimum balance requirement for active-trading platform. Merrill Edge appeals to casual traders with a powerful combination of competitive pricing and robust research. The online broker integrates seamlessly with parent company Bank of America: Customers can access accounts at both with a single login, and Merrill Edge brokerage clients have access to customer support at about 2,500 Bank of America locations. Those who meet minimum balance requirements qualify for a limited number of commission-free trades each month. Commissions and fees: Merrill Edge’s $6.95 stock and exchange-traded funds trade commission is in line with those of many competitors, including TD Ameritrade and E-Trade. It’s a couple of dollars higher than those at Fidelity, Charles Schwab and Ally Invest, which offer $4.95 commissions, as well as brokers like Interactive Brokers that are a good value for high-volume traders. The company’s fees are also competitive, with no inactivity charges. Also, new customers can get 300 free exchange-traded fund and stock trades online for three months. But this particular promotion is no longer touted on the company's website, so you have to ask for it over the phone or at one of their branches. Integration with Bank of America: Merrill Edge is a product of Bank of America’s acquisition of Merrill Lynch, and it’s clear that the parent company has made efforts to create a seamless experience for clients who use both services. You can view your Bank of America accounts and Merrill Edge accounts with a single login, and real-time transfers move money between accounts instantly. The same integrated experience is available on mobile, and you can even view your Merrill Edge investment account balances on Bank of America ATMs. Research: The company provides research from its own BofA Merrill Lynch Global Research, as well as third-party providers, including Morningstar, CFRA, Trefis and Recognia. Mutual fund reviews and rankings come from Morningstar and Lipper, and the company compiles a list of Merrill Edge Select ETFs and Merrill Edge Select Funds, with the top funds in each category as evaluated by Merrill Lynch investment professionals. Merrill Edge’s website also has a lot of educational resources, including videos, courses, webinars and articles, all searchable by investing experience or topic. Morningstar’s investing classroom is available on the site, too. With Merrill Edge's “Fund Story" feature, you can research a mutual fund’s holdings (that is, what it's investing in), the sectors it covers, its historical performance, third-party analyst ratings and more. Plus, the fee analyzer illustrates the cost of owning the fund over time. 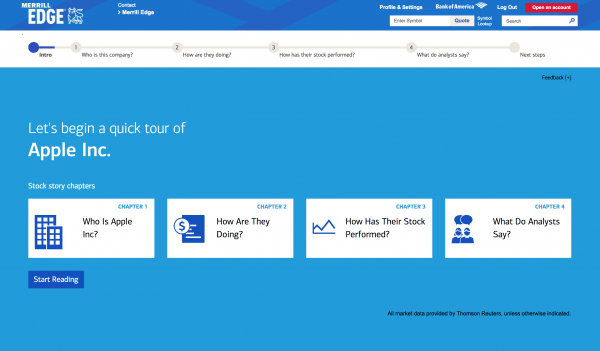 Similarly, “Stock Story” offers detailed information on individual stocks, all in an easy-to-follow format. Trading platform restrictions: Like many brokers, Merrill Edge offers both website trading and an active trader platform, called Merrill Edge MarketPro, which is browser-based. The company’s website is clean and intuitive, and offers several screeners so you can quickly sort through stocks, mutual funds, ETFs and bonds. The MarketPro platform is also robust, with much of what active traders expect: interactive charts, alerts, a customizable dashboard, and streaming data and news. But MarketPro requires Java and has restricted access. It’s available only to customers who maintain a combined balance of $50,000 or more in Merrill Edge, Merrill Lynch and/or Bank of America accounts or make at least 15 trades per quarter. (Customers who qualify for the Preferred Rewards Platinum or Preferred Rewards Platinum Honors programs also get access to MarketPro.) Level II quotes, which show real-time bid and ask prices for Nasdaq stocks, are available only to investors who trade at least 30 times per quarter or maintain a total combined balance of $1 million or more in their Bank of America and Merrill Lynch accounts. Commission-free ETFs: The company doesn’t have any, though the commission-free trading deals available to those who participate in the rewards program, as described above, apply to ETFs as well as stocks (as does the 90-day promotion for new customers, also described above). A lack of commission-free ETFs isn’t unheard of at a discount broker, but it’s worth noting. Even with Merrill Edge’s low-cost commissions, ETF investors may pay more here if they don’t qualify for free trades. Is Merrill Edge right for you? If you’re a high-balance customer who qualifies for one of Merrill Edge’s free trading offers, this could be a no-brainer. The broker has much of what you’d need — high-quality research, a good investment selection and helpful customer service — and you’ll get a limited number of free trades each month. But even customers who don’t qualify for free trading will want to keep Merrill Edge on their short list of options, due to no minimum account balance, low fees, and strong research and educational offerings. The company ranks among the top of the field when it comes to online brokers.